Mongolia is a landlocked country located between China and Russia. It is a vast emptiness that links land and sky, and is one of the last few places on the planet where nomadic life is still a living tradition. 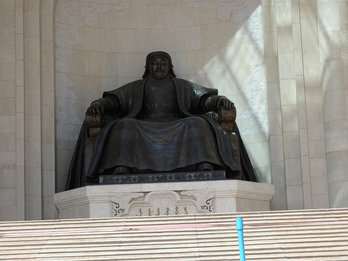 Mongolia may have geopolitical, cultural and geographical meanings. Mongolia consists of historic Outer Mongolia. The province of Inner Mongolia is geographically and politically separate and located in northern part of China yet it shares common borders with Mongolia. With only 1.7 people per km², Mongolia has the lowest population density of any independent country, and it is this vast and majestic emptiness that is the country's enduring appeal, bringing the traveller, as it does, into a close communion with nature and its nomadic inhabitants. Mongolia is entirely landlocked, between China and Russia. Mongolia is nicknamed the "Land of Blue Skies," and with good reason: there are said to be about 250 sunny days throughout each year, so you will need good UV protection. During winter, protect your eyes, and during summer, protect your skin. The weather is bitterly cold during the winter, dropping down to -40º in some parts. With many types of terrain--from desert to verdant mountains--the weather during the summer varies from region to region, but is generally hot. Outside of the Gobi desert, this time of year is marked with many rains in some areas, and it can become quite cool at night. The ideal Mongolia travel season starts in May and hits its highest peak in July, during the Naadam holiday, and in August when the weather is most favourable for travelling. This is the best time if you like the culture and can bear the crowds of other tourists. It is not a good time if you want to get away from your busy lifestyle because you will experience traffic, busy schedules, waiting in lines, etc. September is also a very good time to visit, and October is not too late to travel to Mongolia. It is still warm during the days but a bit chilly during the nights. In the autumn, Mongolia is not very crowded, and this is time for late-comers and last-minute, unplanned trips. You will get to sightsee, enjoy the culture, and taste mare's milk, a bitter and at first somewhat unpleasant drink, throughout the country. For visitors not afraid of cold or fermented mare's milk, travelling to Mongolia from November till the Lunar New Year is still an option. Winter tourism is a developing area of the Mongolian tourism industry. The most rewarding experience will be visiting the nomads, as this is the time when you will experience their culture first-hand during "Tsagaan Sar" or the traditional (Lunar) New Year celebration. Travellers will have the opportunity to watch lots of cultural activities: singing, dancing, wrestling, and winter horse racing.